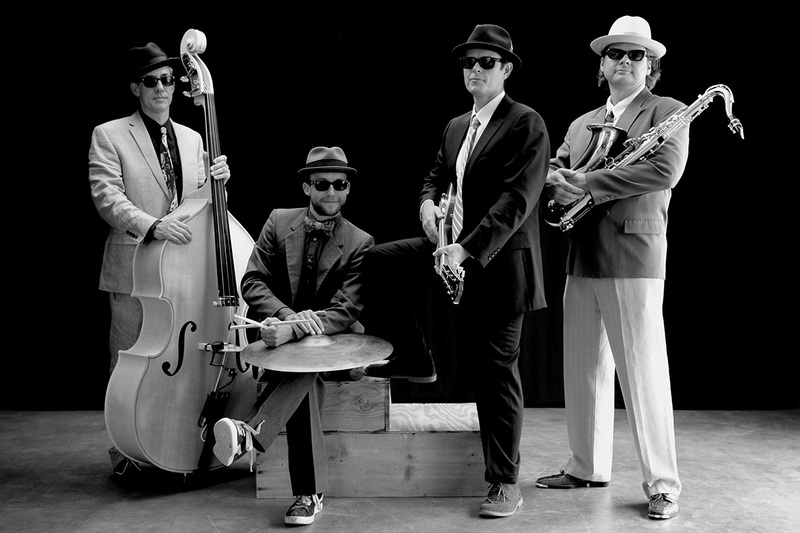 The Big Swing Theory began as a blues band in 2009. Conrad and Jackson spent an eternity trying to track down the remaining members to fill out their group. When the two met Jeremy Jones, and heard his charismatic and sensual saxophone style, they realized they had found the perfect horn player, but didn’t play the right type of music. The addition of Jeremy shifted the focus of the band from straight Blues over to Jump-Blues and swing. For years the group included Casey Arrillaga on drums, but when he moved in 2013, Max joined the band. The Big Swing Theory plays around Taos, New Mexico regularly. You can catch them at the Taos Inn on the first Friday of every month and every Wednesday night at the KTAOS Solar Center. The Wednesday night shows at KTAOS also include free dance lessons! Make sure to check the KTAOS calendar to confirm they are playing before going, schedules can change. The Big Swing Theory is available for private events, parties, weddings, and other awesome get-togethers! The band gets dressed up and snappy for every performance, and not only do they look great, they are very professional! If you need a band and a PA for your event, they can do that too. The Big Swing Theory packs a sound system big enough for big outdoor spaces and small intimate settings. Get in touch, they LOVE to play music!